There are so many worthy causes to support, which can make it tricky when working to promote YOURS. How can you leverage specific times of the year to create buzz around your mission? How do you make your campaign stand out against the others? 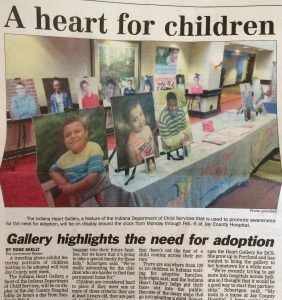 One important project that our team is proud to manage is the Indiana Heart Gallery for the Indiana Department of Child Services. The Heart Gallery is a traveling photo exhibit featuring children in foster care who are available for adoption. (You can learn more in this past blog post). While we work year-round to promote foster adoption, we really amp up our efforts during November which is National Adoption Month. We latch onto the buzz already generated throughout the month to bring attention to the need for adopting older children. While this cause may be different from your organization’s, the methods we used to raise awareness can still be applied! Get ahead of the message by hosting a press conference to communicate your efforts. 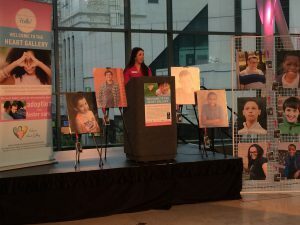 On November 1st, the Indiana Heart Gallery had a press conference to kick off National Adoption Month. We were able to use this platform to set the stage for a month long campaign. We invited partners with similar goals to join us and highlighted their efforts as well. We also brought in big name speakers, like the Indiana Department of Child Services Director Mary Beth Bonaventura and Supreme Court Judge Mary Willis, to add credibility to our presentation and attract attention. 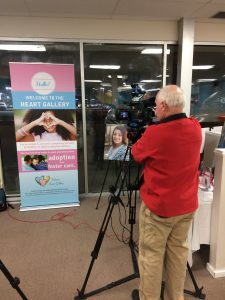 This press conference allowed us to educate the public on National Adoption Month as a whole, communicate the goal of the Indiana Heart Gallery, and promote upcoming events. Occasionally, you have to do things differently. Offer your supporters (or potential supporters) a fun night out or an unique opportunity to get involved. While the Indiana Heart Gallery travels to different venues every month, it’s usually a standalone exhibit. This structure works great for achieving our month-to-month goals, but occasionally we need to spice things up and offer a different way to engage the public in our project. We do this by hosting Family Fun Events. 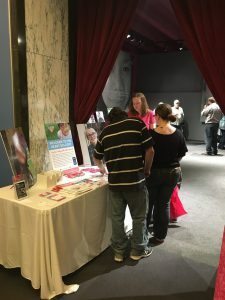 During these events, we have adoption staff on-hand to answer specific questions about the foster to adopt process and usually have fun freebies to entice families to come! For example, we hosted a Family Night at both the Memorial HealthWorks! Kids Museum in South Bend and the Children’s Museum of Evansville. We cover the entry into the museum, refreshments, prizes, photo booth and then feature the Indiana Heart Gallery. We share personal stories of adoption and connect families to local resources. The goal is to engage people who don’t know much about foster adoption and allow for an informal setting for them to learn more. These events led to many families ready to take the steps toward adoption! It was an informal, fun environment where they could learn key information about foster adoption without any commitments. Even if you’re already very active on social media, don’t be afraid to try new things. Especially during your awareness building campaigns. For the Indiana Heart Gallery, we have a strong following on both Facebook and Twitter. Typically we will post daily news, statistics, and information about our events. During November, we used Facebook ads to really enhance our campaign and start reaching those people who have never heard of us. With a small budget, we were able to set specific demographic criteria and reached nearly 2,000 new people to share our message. 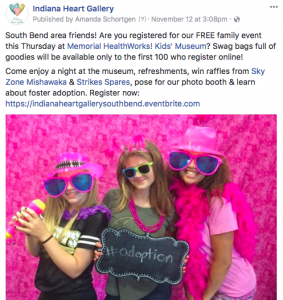 We also did strategic email blast posts to supporters and partners alerting them of events happening in their area and to share information about National Adoption Month. Think differently about leveraging the communication tools you have available to promote your cause. We shared tips for writing press releases in this blog. Press releases are a great way to communicate your cause. For the Indiana Heart Gallery, we often use press releases to highlight events, but they can also be used to share information or statistics about your cause. Send them strategically during your campaign and remember to always follow up with calls, emails, or additional information! Our TCG team worked hard to pull together all the above (and more!) to make November a success for our client and ultimately the children waiting for a family to call their own. It’s what we do when we manage a project. 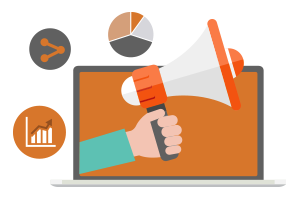 Want to learn more about how we can partner on your next big project or campaign? Contact us today! At Transform Consulting Group, we are honored to serve many clients who are working hard to make a difference in the lives of children, families and their communities. While we partner with them on behind the scenes work (see our services here), we also want to help them promote the good work that they do. A press release can be the quickest and easiest way to get FREE publicity and raise awareness about your cause or nonprofit. You should not be the best kept secret in town. If the community is unaware of your great services and impact, then your efforts will fall short every time. We often encourage our clients to share their mission by writing a press release that can lead to media coverage, future leads, dollars, etc. Have a newsworthy story. YOU may think a program, service or event is really great, but what is the impact beyond your organization or the clients you serve? Why would anyone else care? While composing your press release, make sure you are communicating that your story is newsworthy. It needs to appeal to everyone who is tuning in to that TV station or picking up the newspaper. Make it timely. Timing is everything, and you can definitely use this to your advantage. Keep up with national news and maybe you can put your own local spin on something that people are already talking about. For example, if you want to get the word out about free student programs, connect your press release with the back-to-school conversation. Write like a reporter. Notice how the reporters deliver their stories next time you turn on your local news. You’ll probably hear how many of the stories they read have a very conversational feel to them—and so should your press release. Avoid fancy words, business jargon, technical terms, or formal statements that no one uses in real conversation. Write like you talk. Make it personal. Think about the news stories that capture YOUR attention. Usually, it will be the story with a face. You can ramble on and on in a press release about how your organization is offering this new program for free to this many people, but what really appeals to the viewer is if you put a face to the cause. In your press release, quote a single mother whose life is changed because of your program or a college student who against all odds graduated with honors through your college readiness program. Those are the true stories; so tell them! Offer a complete package. There are several elements needed for a reporter to successfully tell a story. First, they need people to interview. It is helpful to have an official “voice” who can be the spokesperson at your organization or person heading up the program. This interview will cover the facts about the story, but you need to provide a personal voice as well. The personal interview may include a client or family who is benefitting from your program. Along with the interviews, any newspaper or TV reporter will need some sort of visual. Make it easy for them to take photos or get video that helps tell the story. If they can’t cover the story in person, then offer to send them photos yourself. It may require more planning on your part, but if it means positive publicity, then it is worth it. Have all these elements ready to present when you pitch your story to the news. Follow up. In addition to sending a press release and having the right elements, you need to make follow up calls to media outlets. We recommend sending a press release at least one week before your event and then send it again on the day of the event, followed by a personal call. Compile a list of emails from all the newspapers, TV stations and radio stations in your area and then continue to add to the list as you make connections. Reach out separately to any contacts you’ve worked with on past stories. If you hand a story over to a reporter with all the elements in place, who can turn you down? 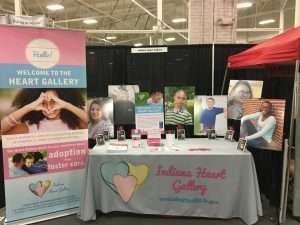 As we previously mentioned (here), we are honored to manage the Indiana Heart Gallery for the Indiana Department of Child Services. The Heart Gallery is a traveling photo exhibit featuring children in foster care who are available for adoption. It’s a great, heart-touching story, right? BUT if we don’t adequately promote the display and get the word out, then all of our efforts are wasted. People have to KNOW we are bringing the gallery to their community, and we use the media to help get the word out. You’ll often see stories about foster care and adoption in the news, which tells us we aren’t the only ones who view this as a compelling, newsworthy story. However, it can be challenging to make this story timely as this is a year-round project, so we have to get creative. For example, we displayed the Heart Gallery at the South Bend Airport during March and April and tied it in with Spring Break travelers. We are constantly reworking our releases to be easy to read and understandable. While our display literally puts a face to the story, we also call on volunteer photographers or parents who have adopted foster children to be interviewed and provide a unique element to the story. At Transform Consulting Group, we want to help tell the story of your cause. Contact us today for a free consultation!